Do you have tall devices to test, especially ones needing plenty of I/O? The JRE 1720 is the answer! Like its other brothers in the JRE test line, it features rugged welded aluminum construction with superb RF shielding effectiveness. Long life door gasket material along with double edge engagement not only provides solid RF shielding, but smooth trouble-free operation over its lifespan. 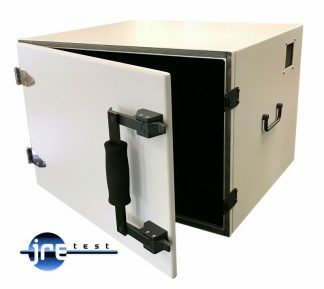 A JRE exclusive, our triple door locking mechanism allows easy single handle door operation. 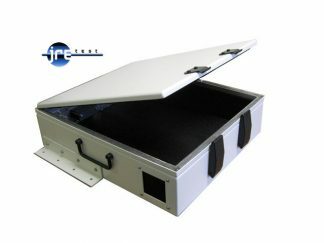 Ventilation is standard with our JRE exclusive honeycomb style vents in enclosure rear and door. 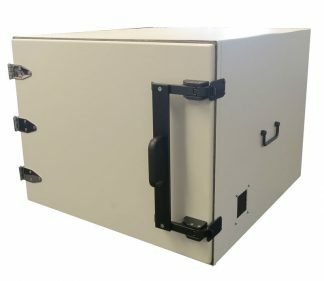 A pair of universal I/O plates allow almost any device to be interfaced inside the enclosure, and internal electromagnetic absorbing material reduces RF reflections and hot-spots. 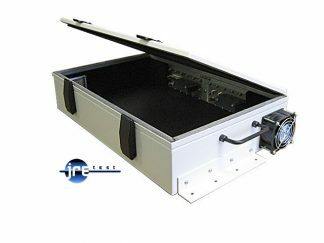 Two universal I/O plates (7" x 7" 180x180mm) with incredible connector options. 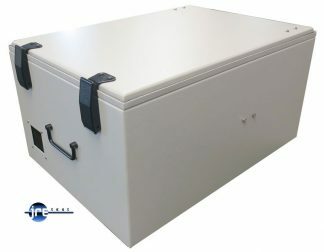 Easily changed in the field for multiple uses or interchange with other enclosures. JRE Test "C" size I/O Plates. Fiber optic: Fiber optic bulkhead feed thru: Type ST, FC. Power connection: 4 or 6 terminal barrier strip, 2500 pf filtering. 120/240 VAC power strip.